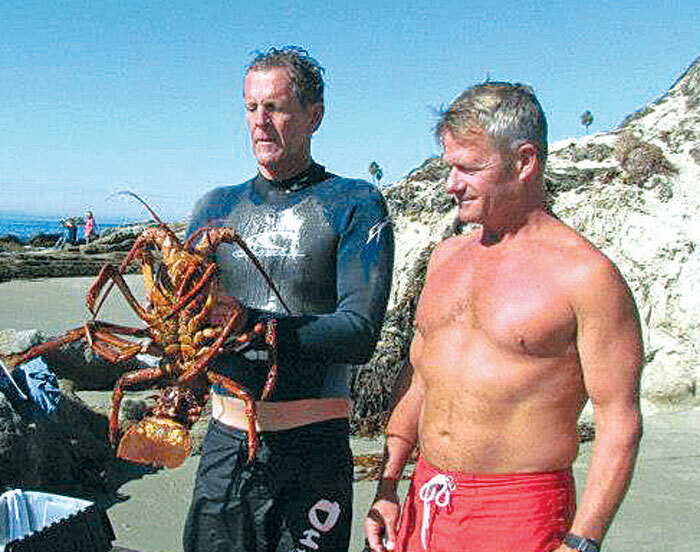 DANA POINT — One lobster in Dana Point was lucky enough to get caught and live to tell the story, thanks to a group of Orange County businesspeople, anglers and California Department of Fish and Game wardens. The lobster, nicknamed “Lucky Louie,” was caught by a commercial fisherman from Huntington Beach, who sold the 10-pound, possibly 80-year-old crustacean to John’s Fish Market in Dana Point. It was in one of the fish tanks at the market that Dana Point resident Mike Warrick saw the lobster. And, with the help of local boaters, anglers and Dana Point restaurant owners, he purchased to lobster for $230 to release it back in the ocean. Warrick and the recently formed group that calls itself “Big-Bug Rescue” notified the Department of Fish and Game (DFG) of its plan to release the lobster into Laguna Beach’s State Marine Reserve, allowing the lobster to continue producing eggs and further the population in the area. DFG warden Spencer Gilbert was on hand for the release of the lobster back into the water, to make sure the release went smoothly and to give the OK to release the lobster into a marine reserve, as it is illegal to possess lobsters inside a preserve — even with the intent to release. The practice of releasing marine life back into the wild is highly regulated, and Gilbert said fines ranging from $10,000 to $60,000 could be assessed for those found in possession of lobsters in a marine protected area. While Gilbert and DFG biologists gave the OK for the release, he said the action was not one he expects to be replicated, as the process of releasing lobsters from captivity back into the wild could lead to the spread of any contaminants the lobsters may acquire while in aquariums.